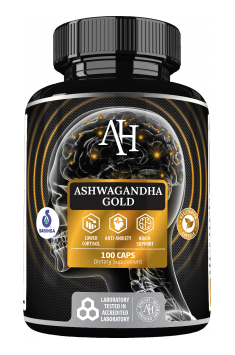 Apollo’s Hegemony Ashwagandha Gold is a dietary supplement containing a high-quality extract obtained from a certified organic root of Withania somnifera - Ashwagandha, standardized for the content of 7% withanolides, 0.25% withaferin A and 1% alkaloids. The preparation contributes to increasing the organism’s immunity to stressors, the improvement of well-being and positively influences general health of the organism. The supplier of the extract is Sabinsa Corporation - a valued supplier and producer of high-quality products, including standardized plant extracts, cosmeceuticals and dietary supplements. The product appears in the form of vegan capsules. Withania somnifera, also known as Ashwagandha, is a plant known and used for thousands of years in the Indian system od natural medicine - Ayurveda, due to its exceptional properties. Ashwagandha has become an object of many scientific studies and currently it may be “proud” of abundant documentation, confirming its adaptogenic properties. The root of Ashwagandha is the richest in the active compounds, as it contains i.a. alkaloids, withanolides A-Y, phytosterols, phenolic acids and minerals. The main compounds conditioning the activity of the plant are withaferin A and withanolide D, belonging to withanolides, however, increasingly more studies prove that bioactivity of this plant to a large extent is related to the content of other ingredients. Withanolides have documented anticancer, antibacterial, cytostatic and calming properties. They also decrease blood pressure. Moreover, they demonstrate the ability to stabilize hormonal balance. The mechanism of activity of withanolides consists in i.a. sensitizing serotonin receptors 5-HT, intensifying the activity of serotonin. This is reflected in better mood, antidepressant and anti-stress effect and the increase of cognitive functions. The best-known compound of the withanolide family is withaferin A. It has been demonstrated to be an inhibitor of the transcription factor Sp1, which is a regulating element in the expression of many genes, the so-called transcription activation domain. Sp1 affects the expression of the genes that participate in, for example, the process of cell apoptosis, growth, multiplication, aging, or carcinogenesis. Sp1 overexpression can be observed in many types of cancer and may signal poor outcome; therefore, the factor can be a potential target in anticancer therapy. Adaptogens are a group of substances of plant origin, which have positive influence on the nervous system - they alleviate and counteract harmful effects of exposure to stressors by increasing adaptive abilities of the organism. Ashwagandha increases adaptation of the organism to stress factors. The exposure of the organism to chronic stress entails many negative effects for the organism. Ashwagandha minimizes the consequences of long-lasting exposure to stress and supports regeneration of the organism after burden with long-lasting physical and mental effort. There is some evidence that Withania somnifera has anti-stress effect and reduces the level of cortisol, which is reflected in decreased fatigue, improved well-being, better vitality and sleep quality. Numerous scientific studies suggest that supplementation with Ashwagandha may have positive influence on physical efficiency both in sportsmen and in less physically active people. It was observed that Withania somnifera contributes to the increase of strength and muscle mass, the improvement of oxygen efficiency and it has positive influence on the composition of the body and reduction of spare adipose tissue. Ashwagandha facilitates the functions of the central nervous system. It was discovered that its supplementation may considerably support regeneration of axons and dendrites in nerve cells and initiate the growth of damaged and healthy cells of the brain. Withanolides and flavonoids contained in Ashwagandha demonstrate strong antioxidant activity. Antioxidants neutralize the activity of reactive oxygen forms, which contributes to the prevention of civilization diseases and inhibits aging processes. Ashwagandha also influences maintaining proper lipid profile (decreasing cholesterol level, triglycerides and LDL), regulation of blood pressure and it also supports heart function, thanks to which it has positive influence on the cardiovascular system and decreases the risk of developing circulatory system diseases. To sum up, Apollo's Hegemony Ashwagandha Gold is a high-quality natural dietary supplement. The presence of the standardized extract guarantees effective activity of the preparation. The product is especially recommended to people prone to long-lasting stress, leading an intensive lifestyle, having problems with regeneration, memory and concentration and dealing with mood fluctuations. The preparation contributes to increase energy level and vitality and supports regeneration of the organism after long-lasting diseases. Jak dla mnie produktu nr jeden, stosuję juz 6 opakowanie.Wieczorem jedna kapsułka i odczuwalnie polepszenie jakosci snu, regeneracji. Budzę się wypoczęty nawet przy małej ilości snu. Idealny produkt na obniżenie kortyzolu po długich wybieganiach ponad 20km i mega obciążających wytrzymałościowo.Stosowana w dzień mnie akurat za bardzo przymulała. Rzeczywiście mocno przekłada się pod trening siłowy - świetna regeneracja. Do tego zauważalny stan wyluzowania, uspokojenia, zupełnie inna tolerancja stresu przez organizm. Jedyne co mi delikatnie przeszkadza to fakt, że działa moczopędnie. POLECAM, biorę 2 kapsy dziennie. Jak zawsze ashwagandha dobrze się sprawdza. Działanie odczułem po tygodniu w postacie większej energii, libido i jasności umysłu. Niestety po ponad miesiącu już tego nie odczułem. Wkręca się jakiś czas, ale suplement na prawdę spoko poczułem działanie. Jako osoba paląca trawę i papierosy o średnio zdrowym trybie życia czuje, że ten suplement na prawdę działa ewidentnie lepsza jakość snu co przekłada się na efektywniejsze funkcjonowanie w ciągu dnia poza tym odporność na stres wzrosła i uspokoiły się nerwy oraz obniżony nastrój już tak nie dokucza. Świetny ekstrakt spisuje się na medal! Effective doses of Ashwagandha extracts are ca. 500 mg per day.Producers of the supplement often recommend using 1 tablet two times a day before meals. To achieve a desired therapeutic effect, Ashwagandha should be taken for at least a few weeks. There is no doubt that the advantage of using natural supplements is gradual and ensures long-lasting improvement of the state of health. Four forms of magnesium with vitamin B6. It improves the cardiovascular system and nervous system.